Archive for NCAA – R.I.T. After the home side had worked so hard to finally go back in front almost halfway through the final period, the visitors required less than four minutes to find an equalizer as host PENN STATE and the ROCHESTER INSTITUTE of TECHNOLOGY skated to a 3-3 in an NCAA non-conference affair in front of a standing-room-only crowd of 6,211 spectators at the new Pegula Ice Arena. Penn State began when enough when DYLAN RICHARD, the freshman who had sat out the Nittany Lions’ last game against Air Force in Colorado Springs, scored his very first career NCAA goal to give the home side a 1-0 lead a little over six minutes into the contest. But Penn State’s problems with maintaining discipline continued to mount when monster right wing ZACH SAAR, the 6’4″ 235-pound freshman from Richland, Michigan, was issued a two-minute minor for charging shortly thereafter and R.I.T. capitalized on the ensuing power play. Late in the first period, the indignant Tigers seized a 2-1 advantage after Nittany Lions senior center TAYLOR HOLSTROM had been sent to the penalty box for slashing. All this, of course, before Penn State sophomore center DAVID GLEN, the Canadian legionnaire who led the Nittany Lions with 16 goals in 27 games last season, was given a five-minute major penalty for kneeing and an automatic game misconduct, as well, at the 19:29 mark of the opening session. 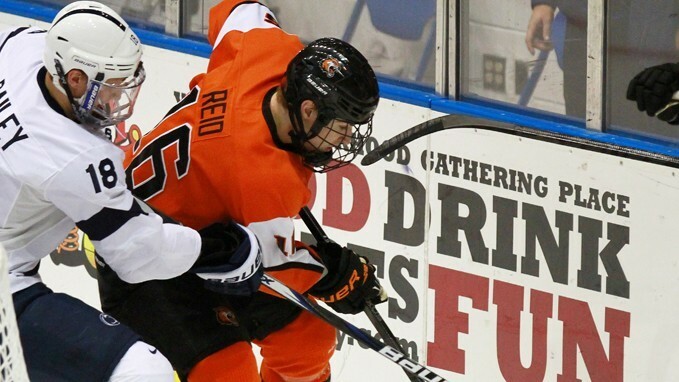 Rochester Institute of Technology defenseman GREG NOYES (20), the Canadian import from London, Ontario, whose name recently appeared on a pre-season feature produced by the official website of the United States College Hockey Organization listing the top ten blueliners in the country, bumps Penn State’s naughty sophomore DAVID GLEN (11) off the puck during the NCAA non-conference meeting at the brand new Pegula Ice Arena. Penn State, led by captain TOMMY OLCZYK, did yeoman’s work to kill off the major penalty, most of which coincided with the start of the second period. The Nittany Lions were finally able to get back on level terms with less than five minutes to skate in the second period when sophomore right wing ERIC SCHEID, the transfer from the University of Alaska – Anchorage who tallied a goal in each of his first two games for Penn State this season, set up linemate DAVID GOODWIN for a one-timer on the power play. It was a second goal in as many games at the brand new Pegula Ice Arena for the freshman Goodwin, who, like his classmate Richard, had also not dressed for the Nittany Lions’ second game at Air Force the previous weekend. Despite all of its troubles staying out of the penalty box on this night, a redemption-seeking Penn State were still presented with a tremendous gift with almost nine minutes expired in the third period. Nittany Lions sophomore left wing CURTIS LOIK, the Canadian import from North Vancouver, British Columbia, cruised into the offensive zone on the right side and lofted a seemingly harmless puck towards the net that the Tigers goaltender JORDAN RABY, the junior from Tavistock, Ontario, who, otherwise, had a pretty good night stopping actual shots, completed misjudged and, somehow, permitted to enter the R.I.T. net. It was a stroke of luck, to be sure, but Penn State’s good fortune would not last long. This because R.I.T. left wing BRAD MCGOWAN, the undrafted junior from Vancouver, British Columbia, who scored 18 goals (75 games) in his first two varsity seasons with the Tigers, wisely managed to avoid the tangled crowd at the front of Penn State’s cage and deftly backhanded the puck into the upper corner of the Nittany Lions’ net about four minutes later. There was no more scoring in either regulation or the five-minute overtime period and, therefore, the Penn State – R.I.T. contest is entered into the official NCAA records as a tie. Penn State center DAVID GOODWIN (9), the freshman from Des Peres, Missouri, who seems to benefit from skating at the Nittany Lions’ brand new hockey rink, races past Rochester Institute of Technology right wing DAN SCHULER (23) during the NCAA non-conference clash viewed by an overflow crowd at the Pegula Ice Arena in State College, Pennsylvania. Penn State center DYLAN RICHARD (12), the freshman import from Sherwood Park, Alberta, slips the puck through the five-hole of fellow Canadian legionnaire, Rochester Institute of Technology goaltender JORDAN RUBY (40), to net his first-ever collegiate goal in the United States of America during the NCAA non-conference match-up at the sold-out Pegula Ice Arena in State College, Pennsylvania. October 28, 2013 · Filed under NCAA - Penn State, NCAA - R.I.T. Rochester Institute of Technology left wing JEFF SMITH (21) is sandwiched between Penn State right wing MICHAEL MCDONAGH (8) and defenseman NATE JENSEN (24) during the NCAA non-conference match witnessed by the sell-out crowd of 10,556 spectators at the Blue Cross Arena in Rochester, New York, on October 20, 2012. It was not all that long ago that the ROCHESTER INSTITUTE of TECHNOLOGY took the college hockey world by storm in knocking off Denver University as well as the University of New Hampshire to reach the Frozen Four at the 2010 NCAA men’s ice hockey tournament. With that in mind, it is, perhaps, easy to forget that R.I.T. are only still this year entering just their ninth season skating at the elite Division I-A level. The Tigers finished the 2012/13 campaign with an overall record of 15 wins against 18 losses with five ties and could be in for another rough ride this term, as well. R.I.T. had one outstanding period against the visiting University of Michigan at the Blue Cross Arena in Rochester a couple of weeks ago and courageously fought back from two goals down in the third period to earn a 3-3 draw with Clarkson University its last time out on the ice but remain winless with three losses after their first four games of this 2013/14 schedule. R.I.T. graduated its leading goal-scorer (JEFF SMITH, the left wing from Spokane, Washington, who is now skating professionally for IK Rungsted in Denmark) as well as its best blueliner (CHRIS SARACINO, the defenseman from St. Louis, Missouri, who is now employed by HC Banska Bystrica of the Slovakian elite league) but, otherwise, returns almost everybody else. Rochester Institute of Technology defenseman NOLAN DESCOTEAUX (2), the senior from Dallas, Texas, who easily led the Tigers with 62 penalty minutes last season, skates around University of Michigan blueliner BRENDAN SERVILLE (6), the Canadian legionnaire who is a third round NHL draft pick of the Winnipeg Jets, during the NCAA non-conference match a couple of weeks ago (Wolverines won 7-4) at the Blue Cross Arena in Rochester, New York. Canadian legionnaire GREG NOYES is one player to pay close attention to on the R.I.T. blue line as the senior (6’0″ 185 lbs) from London, Ontario, is listed among the nation’s top ten defensemen by the official website of the United States College Hockey Organization. Noyes is a legitimate offensive threat who recorded 29 points (nine goals) in 38 games for the Tigers last season and, overall, has 18 goals and 46 assists from 117 games in his NCAA career, to date. ALEXANDER KUQALI, the sophomore from Pittsburgh, Pennsylvania, who is the largest (6’2″ 225 lbs) of all the R.I.T. skaters, is now the regular defense partner of Noyes. The other regular pairing on the R.I.T. blue line is comprised of experienced senior NOLAN DESCOTEAUX (6’1″ 195 lbs) and sophomore BRADLEY SHUMWAY (6’1″ 190 lbs), two similar players who are both the quintessential “stay-at-home” type of defenseman. The third tandem at the back for the Tigers is a bit unsettled at the moment, with five other defensemen (including three freshmen) all having skated in at least one contest for R.I.T. so far. The workhorse in between the pipes for R.I.T. this term will be Canadian legionnaire JORDAN RABY, the 21-year-old junior from Tavistock, Ontario, who appeared in 21 games (3.05 avg, .911 save pct) for the Tigers a year ago while splitting time with the departed Josh Watson. This because the two untested backups behind Raby on the depth chart, sophomore KEN MCLEAN and freshman MIKE ROTOLO, have a combined 40 minutes of college hockey experience. Not surprisingly, Raby, who sported a record of eight wins against ten losses with one tie last season, has been ever present in all four of R.I.T.’s contests (243 minutes, 4.19 avg, .873 save pct) thus far. Canadian legionnaire MIKE COLAVECCHIA, the senior center from Richmond Hills, Ontario, is the highest-scoring player to return to the R.I.T. program having shot 12 goals in 32 games for the Tigers last season. Colavecchia, who is off to a fine start with three goals in his first four games this term and has, overall, found the back of the net 35 times in his NCAA career, missed R.I.T.’s inaugural contest with Penn State a year ago. BEN LYNCH, the senior center (5’10″ 180 lbs) from Blaine, Minnesota, who totaled 10 goals and 26 points for the Tigers last season and has also fired three goals in his first four games this term, as well as Canadian compatriot JOSH MITCHELL, the creative sophomore right wing (5’11″ 180 lbs) from Osoyoos, British Columbia, have been Colavecchia’s regular linemates thus far. Canadian legionnaire MATT GARBOWSKY, the junior center (5’10″ 185 lbs) from St. George, Ontario, who blossomed into R.I.T.’s leader with 33 points (eleven goals) last season, returns and is flanked by a pair of fair-sized classmates who both hail from the Canadian province of British Columbia, left wing BRADLEY MCGOWAN (6’1″ 180 lbs, Vancouver) and right wing BRAD REID (6’2″ 195 lbs, Tsawwassen). One experienced player whom R.I.T. were undoubtedly counting on to score a few goals has yet to make his first appearance of this 2013/14 campaign — ADAM MITCHELL, the big (6’3″ 215 lbs) senior winger from Crofton, Maryland, who has netted eight game-winners among his 31 career goals in 94 NCAA contests, is, in fact, the largest of all the Tigers’ forwards. 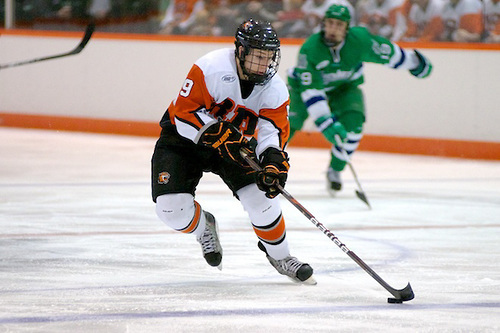 Rochester Institute of Technology have exactly one player on its current roster who has already been reserved by a National Hockey League club — redshirt junior right wing ANTHONY HAMBURG (6’1″ 190 lbs), a transfer from Colgate University, was tabbed by the Minnesota Wild in the seventh round (# 193 overall) of the 2009 NHL Draft. October 24, 2013 · Filed under NCAA - R.I.T. Far more accustomed to playing at the little Greenberg Pavilion (official capacity : 1,300 spectators) in State College as compared to in a bona fide professional arena, Penn State sophomore goaltender P.J. MUSICO was certainly not frightened by the occasion and put on a sensational performance against host R.I.T. in last season’s NCAA non-conference clash at the Blue Cross Arena in Rochester, New York. Playing just the school’s fourth-ever Division I-A ice hockey contest — before a sellout crowd of 10,556 spectators at the Blue Cross Arena, the normal home of the American Hockey League’s Rochester Americans, no less — visiting PENN STATE used a pivotal second period strike and sensational goaltending to upend more-experienced host ROCHESTER INSTITUTE of TECHNOLOGY 3-2 in upstate New York. Canadian legionnaire CURTIS LOIK, the freshman left wing from North Vancouver, British Columbia, found himself unmarked in the slot and buried a fine centering pass from KENNY BROOKS, the freshman right wing from Las Vegas, Nevada, with a scant ten seconds left in the first period to score his first collegiate goal and provide a little hint of what was to come. Penn State went ahead for good almost halfway through the game when MAX GARDINER, the sophomore transfer from the University of Minnesota and the only one of the Nittany Lions’ players to be drafted by a National Hockey League club, made a fine pass in the offensive zone to set up opportunistic left wing COREY BAILEY down low at the side of the net. Bailey, the freshman from Anchorage, Alaska, who would go on to lead Penn State with 13 goals during its historic first season of NCAA varsity hockey, had his initial shot stopped by R.I.T. goaltender JOSH WATSON but alertly batted the rebound out of the air past the helpless Tigers netminder. Gardiner, who registered one goal in 17 games as a freshman for the Golden Gophers during the 2010/11 NCAA season, then recorded his first career goal for Penn State with a critical strike on the power play to give the Nittany Lions a 3-1 lead almost seven minutes into the third period. Penn State were heavily outshot 20-5 in the final frame and also forced to contend with a five-minute major penalty when left wing GEORGE SAAD, the homegrown senior from Wexford, Pennsylvania, was given his marching orders for checking from behind. Nittany Lions goaltender P.J. MUSICO, the sophomore from Orange, California, who had been tending the nets for the Nittany Lions’ ACHA club hockey team less than twelve months earlier, stopped an impressive 40 of 42 shots faced against Rochester Institute of Technology and was a consensus choice for for the contest’s Most Valuable Player. Penn State left wing COREY BAILEY (18) bats the puck past R.I.T. goaltender JOSH WATSON (30), the inexperienced junior from Burlington, Vermont, who appeared in just a combined seven games over the course of his first two seasons of collegiate hockey with the Tigers program, during the second period of the last year’s NCAA non-conference match at the sold-out Blue Cross Arena in Rochester, New York. October 23, 2013 · Filed under NCAA - Penn State, NCAA - R.I.T.